When we heard about Dropbox’s code name “Project Infinite” at last year’s Dropbox Partner Forum we could hardly contain our excitement. It promised a feature that all of us here at IP6net were convinced would be a game changer for the file sharing and cloud storage solution provider. It was finally released last week; and it doesn’t disappoint! Over the last 10 years we have seen hard drives rapidly increase in size, with laptops regularly coming complete with 1TB of storage as standard, but when Solid State Drives were released, clients raced to upgrade desktops and laptops with silicon based drives. These delivered around 50% more performance than their magnetic predecessors with one small problem; space. An average SSD delivered about 1 tenth of the space of a traditional hard drive. As users transitioned away from file servers in favour of solutions like Dropbox Business this posed a big problem; lack of local file storage. Our technical team would regularly educate users on how to manage Dropbox Selective Sync on large Team folders so that their tiny solid state hard drives were not over run with data. Now with the official release of Dropbox Smart Sync, users working with just 128 GB of hard drive space can easily scroll through terabytes of files to find exactly what they need, directly from Windows File Explorer or macOS Finder. Admins can decide whether new content on managed devices starts out cloud-only or synced. And since new files are cloud-only by default, users can accept collaboration invitations without fear of overloading their hard drive. IP6net are Dropbox Select Resellers. 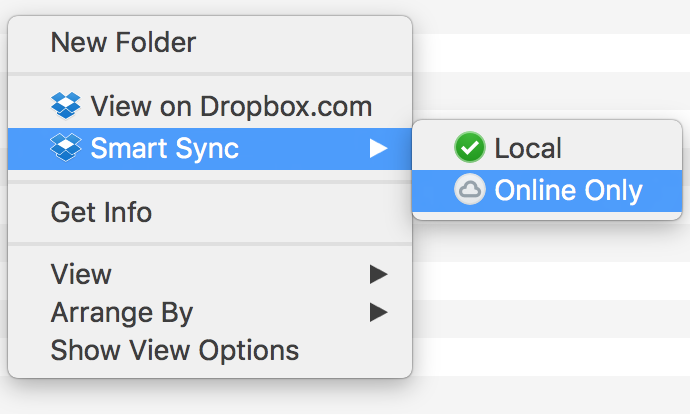 For more information on how we apply our Exceptional Support wrapper to Dropbox Business, get in touch now and start benefitting from features like Smart Sync.